I’m Courtney Alexander, the Founder of Team Fashion Camp, now on our 5th year as the premier fashion camp on the Westside. I’m a graduate of Parsons School of Design, both the New York and Paris locations. I’ve worked in fashion in New York, Paris, Milan, and Los Angeles as a designer, business owner, stylist, and costumer! But most importantly, I am a Mom. After living in Europe for 5 years, I launched clothing companies in the US and sold to boutiques across the country. I designed and made stage clothes for celebrities such as Cher, Elton John, the Scorpions, and ZZ Top and I worked for CBS, ABC, and Disney…after all this amazing experience, I realized my true passion is inspiring young designers to pursue their dreams by teaching them the behind the scenes of what it takes to make it in the fashion industry. As a mom of two, it has taught me to pay it forward to our future designers. I love mentoring kids and sharing my vast experience in the fashion world -- teaching them about sketching, illustrating, styling, branding, and bringing their designs to life! Through Team Fashion Camp, young creatives get to explore the many career options in fashion. Marah is an organized, results-oriented, consultant specializing in product development, merchandising, and strategic brand building. Her company Fashion Freelance Services offers a variety of services to the apparel industry and beyond. Marah has more than ten years of professional experience in the fashion business, for the past 15 years, her focus has been on apparel manufacturing, merchandising, and soft goods construction. 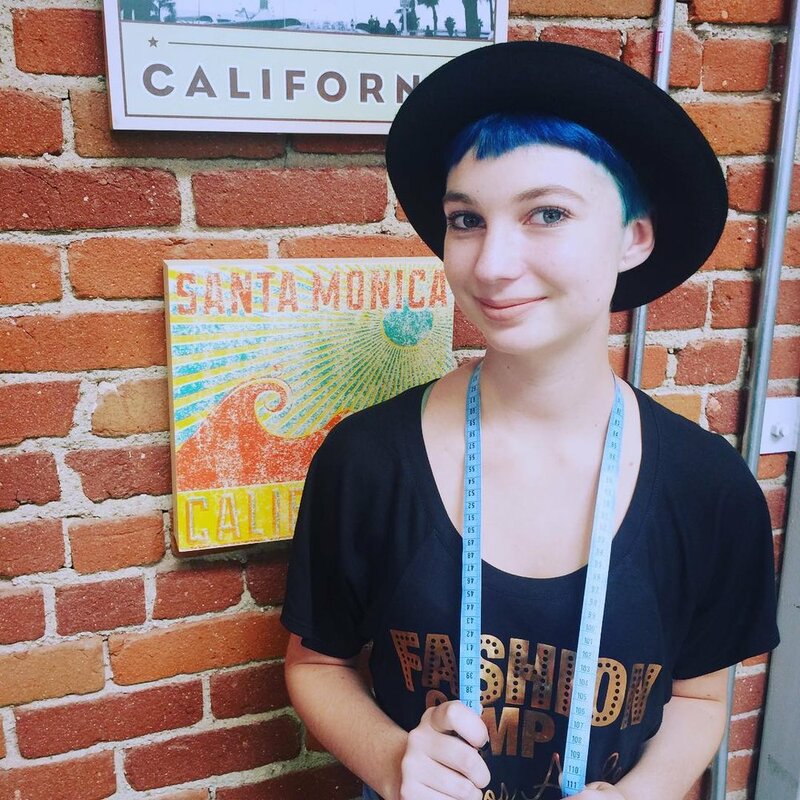 Marah graduated with a degree in Apparel Manufacturing Management from FIDM in downtown Los Angeles. Marah thrives on developing quality apparel and accessories with a focus on function, comfort, innovation, sustainability and technology. Skilled in both production and design, she enjoys creative problem solving and participating in the evolution of the product lifecycle. She also excels at assisting fledging and thriving businesses with all aspects of brand promotion. Marah believes in the power of apparel to contribute positively to the human experience. Molly is an ambitious fashion designer and entrepreneur. She started out modeling for Kansas City Fashion Week and decided to pursue the design aspect of the fashion industry. Molly attended Missouri State University and obtained a double major in fashion design and fashion merchandising from the college of business. She started her own brand, PIECES, and has just released an extension line to the brand called PIECES Paradise- a swimwear and resort wear collection. This summer she will be working in the alterations industry in the fashion district. She has also worked in the public relations field in West Hollywood, managed a clothing boutique, and worked as a receptionist for a bridal boutique. Molly hopes to permanently relocate to Los Angeles and continue designing for her collection. Chloe is an aspiring fashion designer. She will be attending Otis College of Art and Design in the Fall with a merit scholarship in artistic and academic abilities. Chloe is currently working at a hosiery company as a sock design intern as well as experienced in creating portfolios. She attended Team Fashion Camp for three years, then joined the staff for a fourth. Her goals include a BFA in fashion design along with eventually having her own label. She has wanted to be in fashion her entire life and is very excited to be entering that world. Stacy Johnson has extensive experience in the fashion industry in New York and Los Angeles. With a BFA in Fashion Design from Parsons School of Design, Stacy has worked on Seventh Avenue for Calvin Klein, Cynthia Rowley, and J.Crew. She started her own label in 1998, Stacia, with two retail stores in Brooklyn and Santa Monica and sold to over 300 boutiques nationwide. Today she runs her Stacia lifestyle brand online at shopstacia.com and launched a signature fragrance, Bungalow, sold in upscale Resorts. Stacy, a Mompreneur of three, enjoys sharing her love of fashion with inspiring young designers and helping them prepare for a career in fashion. Jovian Amirkiai is a native Californian fashion designer and entrepreneur. Jovian began his journey into the fashion industry while studying International Business at St. Mary's College- CA. During his undergrad, Jovian was able to parallel his studies overseas studying fashion design in Milan, Italy. After graduation he found himself working as a project manager for multiple Fortune 500 companies. While working at Applied Materials, Inc. Jovian spring boarded his education adding a post-grad degree from FIDM in Fashion Design. There he culminated his love for sportswear specifically tailoring his designs for the Menswear market. In his spare time, Jovian plays semi-pro soccer for the City of Angels FC in the National Premier Soccer League. Adam is an Art Institute of Hollywood graduate in Fashion Marketing & Management and made his mark in LA as the Fashion Club President. He saw a need for student growth and experience, and made the club the go-to glam squad in town! Throughout the year, he has helped produce a variety of fashion events such as Art Heart's LAFW, Courtney Allegra's store opening, Fair Trade Fashion Show, and Fashion Unleashed: Barkfast at Tiffany's. Adam also has a passion for sustainable fashion, animal rights, and giving back to his community. He uses the production platform for causes in a FASHIONABLE way to create awareness among fashionistas everywhere! He will be leading our Ready, Set, Runway course at Team Fashion Camp in 2017!